Ophelia, a character in the new novel I’m working on, likes The Book of Tobit from the Old Testament. 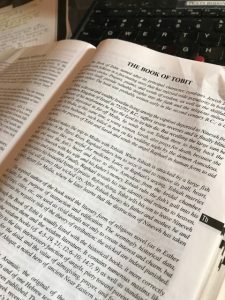 I chose Tobit partly because, like Tobit, Ophelia is blind, and partly because Tobit’s story is beautiful and inspiring, even funny, unlike much of the Old Testament. To be honest, though, my choice of Tobit was also somewhat arbitrary. I don’t know precisely how it will figure into Ophelia’s story. But I assume that it will help me understand and render Ophelia. I make such random decisions often in my fiction. I think it reflects my journalistic experience where, as I report stories, I frequently encounter unexpected facts that I cannot change or ignore but must decide how they work in the tale I’m telling. I welcome these because if I’m surprised, the reader is likely to be surprised too, and surprise keeps readers reading, fiction or non. I suspect Ophelia will surprise with Tobit just as Danny Peters, the autistic boy who’s kidnapped in BLEAK HARBOR, surprised me with his love of Wallace Stevens’s poem, “Of Mere Being.” I chose the poem at random. It helped me understand the boy and his crucial relationship with his mother.